Donald Gifford Mayhew, 87, of Vineyard Haven died Tuesday at Cape Cod Hospital. Donald had a keen memory. He could recite his most direct Mayhew lineage, as was the family tradition, although his ancestry went back to Thomas Mayhew Sr. in 32 different lines. Curiosity led him to understanding and seeking both sides of an issue. He had a keen interest in everything, and often noticed and remembered details others missed. He had a wicked sense of humor, writing droll poetry. Donald looked at the world as a giant puzzle, which is a thread that ran through his life, from the early pursuit of an engineering degree, fixing his own bike, working out how to retire early. His stories of his working life with the Federal Aviation Administration often include details of some puzzle he solved using out-of-the-box thinking. His poetry was a form of puzzle, requiring careful construction. Even his philosophy degree addressed a way of figuring out how the world works. He enjoyed helping others with their computers less for the altruism and more for the challenge of a fresh puzzle. Donald’s family moved off-Island when he was small; he spent most of his life planning to come back. He loved bicycling, and would cycle from their home in Providence to visit his grandparents in West Tisbury. He graduated from Mount Hermon School and Brown University, with some graduate school at Brown in philosophy. He was Navy ROTC at Brown, and served in the U.S. Army occupation troops in Austria in the 1950s. 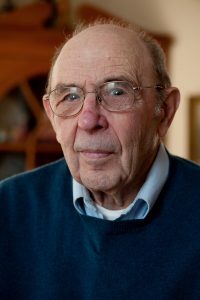 He briefly taught high school math in New Jersey, and ran a bowling alley in Warwick, R.I.
After he married Catherine Merwin (Kay), they moved to Washington, D.C., where he began work as a systems analyst with the FAA, and became fascinated with computers (in those days one would fill an entire room). His family lived in Bowie, Md., for many years. After his early retirement in 1983, his family gift was his first personal computer. He and his wife returned to the Island he loved, where he was pleased to find members from the Washington Ethical Society involved with the Unitarian Universalist Society here. He served as officer and board member of the Dukes County Historical Society, now the Martha’s Vineyard Museum, and diligently worked many hours for the MV NAACP. He was on the original Land Bank committee, and also served on the Tisbury board of health. He loved his family, understanding and enjoying them more than they realized. Besides his wife, he leaves a daughter, Laurel Mayhew and son-in-law Kevin Olson of Colorado, and a son, Craig Mayhew and wife Laura of Westborough. Donald adored his two lovely granddaughters, Rory and Fiona. He is also survived by his brother, Allen Mayhew and wife Doris of New Jersey, and their children, as well as four Clark nephews and a niece, children of the late Spencer and Marguerite Clark. Donald especially treasured his cousins on the Island who have been so good to him, Susie Boass, Judy Bryant, and Nancy Cabot. A memorial service will be announced at a later date. In lieu of flowers, please make a gift in his memory to Mount Hermon School, 1 Lamplighter Way, Gill, MA 01354, or to MV NAACP, P.O. Box 1513, Oak Bluffs, MA 02557. The post Donald Gifford Mayhew appeared first on The Martha’s Vineyard Times.